During a flood, it’s better to equalize water pressure than to fight it. Flood vents (shown at right) can help avoid severe foundation damage by allowing flood waters to pass through foundation walls rather than pounding against them. The changes will mean premium rate increases for some – but, not all -- policyholders over time. The new law encourages Program financial stability by eliminating some artificially low rates and discounts. Most flood insurance rates will now move to reflect full risk, and rates will rise in some policies. Subsidized rates for certain other classes of properties will be eliminated over time, beginning in late 2013. FEMA can help communities lower flood risk and flood insurance premiums. Superstorm Sandy made everyone more aware of the damage that can be caused by flooding –especially in areas close to the ocean. Because meteorologists are predicting an increase in extreme weather in the future, it’s smart to protect your home from damage caused by floodwaters. 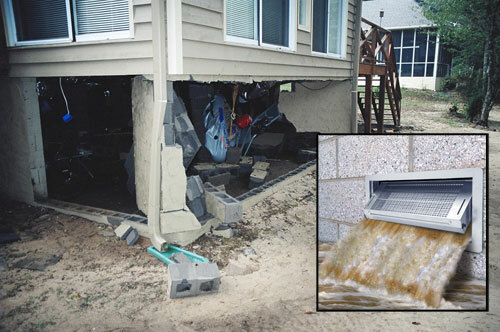 Having SmartVent® Flood Vents installed can help to prevent your foundation from being severely damaged by floodwaters. Flood vent installation also has the potential to lower your flood insurance premium significantly. Homeowners who had their premiums lowered after flood vent installation enjoyed an average savings of 83% on their flood insurance policies. 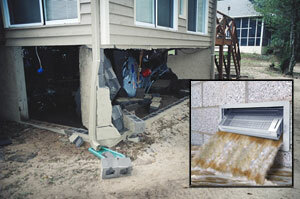 Flood vents are required in foundations built below Base Flood Elevation (BFE) in a flood zone. During a storm surge, floodwaters can impose extreme loads against foundation walls. The force of floodwaters and waves can cause a foundation wall to cave in or collapse. Once this happens, the entire house is exposed to more severe damage. The most effective way to blunt this destructive force is to provide a path through foundation walls so that water pressure can equalize inside and outside the foundation. SmartVent® Flood Vents perform this task flawlessly. When floodwater comes into contact with the vent, an internal float mechanism unlatches the door, allowing it to pivot open. Unlike a screened vent that will trap debris and impede water movement, the Flood Vent provides a clear, clog-free opening that allows floodwater to flow in and out. The vent stays open as long as the water level is high enough to reach the vent opening. Meets building code, FEMA & National Flood Insurance Program requirements. Models available for both vented and sealed crawl spaces. Flood Vents for sealed crawl spaces include insulation and weather stripping for enhanced energy efficiency. Suitable for new construction or retrofit applications. Stainless steel construction to resist corrosion. 8-in. X 16-in. vent size matches standard crawl space vent openings. Mounting flange makes installation quick and easy. 5 different finishes available to match house colors. Each vent protects 200sq.ft. of enclosed area. Flood Vent models available for installation in garage doors, wood-framed walls and other locations. Insulated flood vents are ideal for sealed crawl spaces and insulated walls –any application where flood protection is desired but ventilation is not. With this style of flood vent, the vent door is made from rigid foam insulation surrounded by a durable skin of 316 marine-grade stainless steel. In the “closed” position, weather stripping around the door keeps exterior air out of the crawl space. Alternatively, it’s possible to have SmartVent® Flood Vents installed that contain operable louvers for controlled ventilation into the crawl space. The louvers automatically pivot open or closed based on exterior temperature. For durability and corrosion resistance, louvered SmartVent® Flood Vents are also constructed from 316 marine grade stainless steel. Be certain, safe and smart about flood protection. Call today for a free foundation inspection and SmartVent® Flood Vent estimate. Call 1-844-385-8479.